It was this week three years ago I treated myself to my first week-long yoga retreat in Costa Rica. The retreat was lovely - I ate delicious food, practiced yoga with my teacher, and had wonderful conversations with great people. But there was one night, near the end of the trip where I started feeling depressed. I felt really off, like something was missing. When I tuned in to feel the feeling it felt like this deep unknown hole of sadness inside of me and I had no idea what it was about. Everything on the surface was great. I was in a beautiful tropical location. I was surrounded by loving people. I just didn’t know what it was. Then, the next day in my yoga practice, I had a realization, “I haven’t been sharing my gifts!” A week had passed without writing a blog post, or leading a group coaching call, connecting with a client, giving a speech, singing or teaching a yoga class. I realized the sadness that was setting in was simply a sign showing me it was time to be of service, and share my gifts. Depression and sadness have been a real teacher for me - as a watery Pisces (my birthday is this Thursday!) - I feel a lot, and I’m sure many of you can relate. Over time I’ve discovered it’s that place of authentic sharing, space-holding and teaching, that I feel most ALIVE, JOYFUL and present in the moment. I believe that for those of us that have a deep soul calling to be teachers, healers and space-holders in this life, we are going to start to feel pretty miserable if we are not fulfilling that mission. Do you feel like you have a soul contract to help and uplift others? If so, jumping in and saying YES to that mission is going to deeply impact your sense of well-being. 1. How can I share my gifts? Find small ways to give back, right now. Is there a friend in need? A way you can start that healing practice? Someone you can be a coach or a guide to right now? Sometimes we feel like we need to have it “all together” before we can start helping people. And it’s not the case! You don’t need the perfect website. Or social media brand. Or the big email list. You can start helping people right now! You only need to be one small step ahead of the person you are helping. So how can you put yourself out there? Teach that class or workshop? or reach out to someone in need? It may not look the way you thought it would at first, but the simple act of giving will bring so much joy and meaning to your life. 2. Am I balancing “input” with “output”? While going to retreats and trainings are great (and taking time off is pretty essential to reconnect with your creative flow) if you are only signing up for trainings, courses and retreats without sharing or putting anything out into the world, it can start to feel pretty imbalanced. How much information are you consuming on a daily basis? How many online trainings or retreats did you sign up for in the last year? And how often were you releasing content, and digesting that information into something that could be of service in the world? I’m careful now to not take on too much “input” so I can always be in balance with how much I am releasing “output,” or creatively sharing with others. 3. What fears am I ready to face? It’s through doing the work, that you are going to gain confidence, and it’s the work that is going to fill the void you may be feeling from not fully sharing your gifts. And often we need to take a step before we feel ready. To take authentic action. To pick up the phone. To have the conversation. To put the workshop on the calendar. To practice the free consultation. To teach the yoga class. To have the art show. To give the speech. To write the post. To share your story…. Want to join the conversation? In the comments I’d love to hear: How will you share your gifts this coming month? Almost four years ago I set out in the world as a newly certified coach with a dream to bring women together in an online group program. I called it Let Go, Vision, Transform and imagined these women joining together over many months to support each other in manifesting their dreams. I created a curriculum, where I shared a wisdom teaching each month as well as space to hold live calls for the women to connect with each other. I didn't fully know what I was getting myself into, and spent three months promoting with no one signing up. Even though I was disappointed, I kept showing up. I knew in my heart I was fully committed to this program. Then, three days before the program was about to begin something magical happened. One woman I had had a call with - signed up. Then the next day - three friends I had invited signed up. Then the day the program was about to begin, another woman I admired and invited on a total whim - said yes. And just like that, on the first day of the program we had five women, committed and ready to begin. Four years ago, I fully stepped into my role as a leader. I've been reflecting back on the sweetness of that program, and how my commitment brought forth so much beauty, grace, and friendship between those women over six months. Each and every one of those women are still so dear and close to me and each other. With four more years of skills and expertise under my wings, I have brought life to a new program: The Sovereign Circle. I continue to show up to this work of bringing women together because I know when we enter a sacred container of support like this over several months - pure alchemy happens. When I have had space to open up in vulnerability and openness in a group of other women - to allow myself to rest into that softness and support, I have cultivated so much inner strength and courage. It's because of having supportive groups of women, I have felt myself gain momentum in being able to step up and lead. 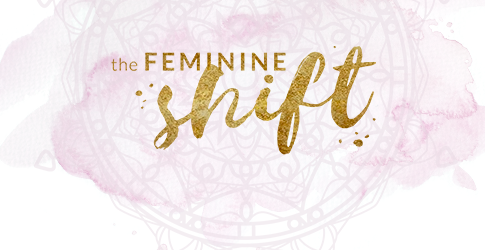 I created this program with the intention of having a sisterhood call every month near the full or new moon for each woman to share herself - her intentions, her challenges, her dreams, and her wisdom. This is going to be a safe and sacred space for the women in the group to show up to support each other. I've been thinking a lot about the archetype of the Queen lately - and that's also why I used the word "Sovereign" in the name of the program. The Queen is regal, autonomous, boundless, and free. She says YES to her power. But really, she says yes to her power because she knows with that power she can give back so much to her people. She stands in her power because she stands for something - and she wishes to give back and uplift others. All the women joining this program have a similar dream - to make a contribution. They all yearn for their lives to have meaning and impact. I am constantly learning, and I have so much new wisdom to share with the women of this group. I decided to design the program with a monthly wisdom teaching recording. Each month the focus of the teachings would be related to a different chakra. The teachings I'll be sharing have deeply impacted my life, and we will have the opportunity to discuss these teachings each month on our live sisterhood call. In the beginning of the program I'll be leading a meditation to support each woman to connect to this idea of the higher self. Connecting to my higher self - my inner wise woman has been such a powerful way for me to come into deeper alignment in my life and work. This program is an invitation for each woman to step more and more into the role of her higher self each day. On our last ceremonial call, each woman will be invited to show up adorned as her higher self and we will be sharing our vows - how we wish to show up for ourselves, and for our great contribution in this life. I will be guiding every step of the way, and cannot wait for this final ceremony in April. he program begins in just two weeks - October 4th. If you've been feeling curious to learn more, I invite you to sign up for a free call with me. I have a feeling this program is going to fill up soon. The energy is building, and just the right group of women are forming. There are now only a few spaces left...Could this be for you? Or perhaps someone you know? When you sign up for a call, I'll send you the program guide with more details about the program and we can have the chance to connect one on one about your challenges, your dreams and all you are ready to step into this year. P.S. This program is filled with amazing guest teachers - check out some of my latest instagram posts to see who will be featured! When I was growing up and heard the word "priestess," I thought of boring sermons at church, wearing clothes I didn't feel comfortable in and being forced to sit quietly when I wanted to play outside. I didn't know much about what it meant to be a priestess other than it was probably the female version of a "priest." As a playful young girl, the thought of becoming a female priest sounded pretty mundane. Then one day, a friend wrote out my numerology. It was the number eleven, which also breaks down to two. In tarot, the eleven (or two) corresponds to the archetype of the High Priestess. She told me in ancient times, the priestess was known for having a heightened contact to other realms through intuition and dreams. The community would seek counsel from priestesses to know what actions to take in their lives. I thought about my life and how I had always had a heightened sense of intuition; of being able to feel into a situation in order to make a decision. I thought of how friends were naturally drawn to me for guidance and consolation during difficult times. Maybe I was a priestess after all. Over a few months, I felt more and more connected to the archetype of the High Priestess and dove into books and articles on the topic. I began to see: the modern day priestess lives anything but a mundane life. Her life is rich in dreams, intuition, ritual, feminine leadership and a connection to the divine. The priestess is not a teacher or leader on a pedestal, but rather, she is of the highest service. She is in service to her community and to her calling. Being of service is not about placing anyone above or below, but rather creating a mutual relationship of respect between the priestess and the women she facilitates and serves. Her work is to become a channel, a vessel to serve the highest good of the divine. She must maintain a practice of self-care to be the most present and abundant in her ability to serve and become a channel. The priestess uses practices such as writing, dancing, movement, meditation, self-care and alone time to hone her ability to listen to intuition. Our intuition is like a muscle that heightens when we pay attention to it. The more she can quiet the busyness of her mind, the more access she will have to the guidance of the divine and be able to step into the role of a channel to those in need. Rituals infuse magic, intention and sacredness into our daily lives. A ritual can turn a mundane act done without awareness into a sacred act with clarity and purpose. Slowing down to say a blessing before a meal changes the experience. Meditation, singing, or lighting a candle imbues a moment of peace and serenity into a busy day. 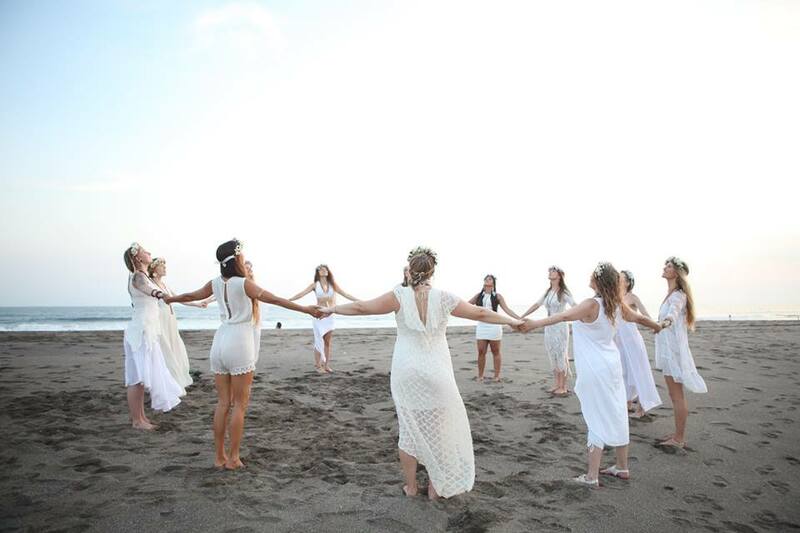 Ritual can also be a healing space where women come together to honor a specific purpose. These rituals may honor transitions, letting go, grieving, the lunar cycle or the change of seasons. Participating in ritual has been one of the most healing ways to mark a big transition in my life. Ritual has provided a space for me to be fully seen, acknowledged and supported by my sisters. After participating in ritual, I feel more confident and courageous to share myself with the world. In ancient times, women slept in tribes, often under the stars and the moon. Their menstrual cycles were in sync with each other and with the lunar cycles: bleeding at the new moon and ovulating at the full moon. You may begin to be more in tune to the natural world and notice energy levels rise and fall. Going out to socialize will make more sense with the heightened energy of the full moon and slowing down to nest will feel perfect at the new moon. For a modern day priestess, creativity, energy levels and social needs begin to flow in tandem with the moon and tides. A priestess can feel the energies of the room and has a heightened ability to feel other people's emotions. This can be difficult for highly sensitive women because the world may sometimes feel like "too much." In my last program, one of the woman "came out" as an HSP (highly sensitive person) and nearly all the others spoke up to share how much they related to and supported her. As a highly sensitive person, you may feel alone in a world of extroverted and gregarious people, however we often forget that heightened sensitivity is a gift. You can fuel your feelings and emotions into writing, singing, and listening with a deeper level of compassion for others. Have you ever dreamt something and realized it became your reality a week later? A priestess often turns to her dreams for guidance. Dreams are a powerful place to explore questions in your life and to connect to the desires of your subconscious self. One practice I use often is re-entering dreams. When you are unsure of how to decipher the symbols or occurrences of a dream, close your eyes and imagine yourself back in the space. Then go to characters and objects one at a time and ask, "What do you have to show me?" You will probably be surprised with the answers your subconscious comes up with. A priestess is a space-holder. She creates the space for others to show up as they are. Have you noticed that people turn to you to guide them through an experience? Holding space is not about planning or knowing what to do or say. It is about becoming present to the moment. All that is needed is to tune into the energy of the person or the group; to listen and ask for guidance within. In the comments, I'd love to hear what a "priestess" means to you and how can you embody the priestess in your daily life? When I first joined a Toastmasters group I was a little taken aback at how nice everybody was to me. The other members went out of their way to get to know me, ask about my interest in improving as a speaker and make me feel at home in an environment where I felt uneasy meeting so many new people. Then last week, I learned their secret: charisma. After our meeting one of the members started telling me about the 3 most important characteristics of charismatic people. As he spoke them, it made total sense to me, "This is how these people are approaching their life, everyday," I thought. I've been applying these principles for the last few days and it has made a huge difference in my interactions. I feel more confident meeting new people, have less social anxiety, and am making more genuine connections. I am walking away from conversations feeling really good. When people have the ability to see the bright side in any situation, it benefits everybody around them. I love being around positive people because they are holding a higher vibration - a vibration that will attract more good into their lives. Through meditation and awareness of my thoughts, I've been able to catch myself when I start going down a negative spiral. I now easily bring myself back to the moment and remember what's going right in my life and what I'm grateful for. It is a gift to see the world through a child's eyes. There is so much appreciation for the little things: the butterfly that lands on the flower, the birds singing in the morning, the warmth of the sun shining on your face. I've been bringing more child-like awe and wonder into my life by spending time with my cat, Quan Yin. In the early evenings we've been walking into the back field together to watch the sunset. I love watching her excitement as I give her my full attention and let her lead the way. Then, when she rolls on her back, waiting for me to pet her belly, I can't help but smile in appreciation. I used to unconsciously worry about how I was being perceived, wondering if others were going to like me. I realize that way of thinking just took me out of the present moment and left me feeling empty after an interaction. Now I am focusing on, "How can I make this person feel like the most important person in the room?" It completely changes the energy. A huge part of charisma is genuinely caring and wanting the best for other people. This shifts the energy off of me and to the person I am talking to. Since I've brought this awareness to my conversations, we both leave feeling better than before. These principles have also affected my speaking and yoga teaching. If I got up in front of a group and worried about what the audience was thinking of me the whole time, I would miss out on making an authentic connection, and probably leave feeling like I could have done better. However, if I can focus on what I want to GIVE and how I want to make the people in the room FEEL, then it is always a win - win situation. Do you ever find yourself uncomfortable in social situations or getting stuck in your head when meeting someone new? I invite you to try out this technique this week. AND - I'd love to hear how it goes for you in the comments below. How to Lead "The Feminine Way"
I see an awakening in women, especially in sweet, kind, soft, and nurturing women who are ready to stand up, express themselves, and share their voice. However, I know from personal experience that a lot can get in the way when stepping up to lead. I struggled with being a shy and sensitive person and wondered, "How I can I really stand out in a world with so many loud voices?" I didn't quite know how to authentically express myself and take action. Then I imagined the kind of world we would live in if there were loving, kind, and sensitive women in leadership roles. I imagined the kind of role models we would have for our children and the kind of healing that would take place on the global consciousness. I knew I needed to make a shift. When I imagined myself stepping up to lead in the way I really wanted to—teaching international retreats, empowering other women to find their voice, speaking in front of large crowds, and leading group programs—at first, I was terrified. But then I realized this fear was telling me something about my future and my purpose: my fear was guiding me to the exact next step I needed to take in my life. I believe our fears bring us closer to our purpose. I began taking action despite my fears and saw that tapping into my soft and sensitive side did not hold me back at all; instead, I found my feminine nature to be an asset in order to lead. As feminine beings, we do not need to change who we are to fit into the world around us. I have found we just need to be supported in facing our fears and listening to our intuition in order to make a bigger impact. Having access to my intuition has been one of my greatest assets to running my own business and stepping up as a leaderin my profession. When I take the time to go on a run or a dance class or sit down on my meditation seat first thing in the morning, I feel like I am continually gifted with amazing ideas. When I tap into my body's wisdom—my intuition—I know how and when to make decisions, and I can trust those decisions won't lead me astray. What I have found to be essential in facing my fears and taking action towards my dreams is the balance between the feminine and masculine within myself. Often, leaders step into their more "masculine" side when taking center stage and forget to honor the feminine qualities of intuition, patience, and self-love. It was important for me to take action, but it was also important to step back and acknowledge what I had done. I learned to find a balance by making time and space to vision and manifest while taking grounded action towards my dreams. When I created the space for my creative, feminine nature, I suddenly found myself more ready to take big stepsin my career. After I faced a fear, I discovered it was so important to rest into self-love and self-care. That was when I accepted and nurtured myself for exactly where I was. I gave myself permission not to have to change too fast. This has been key in avoiding potential "burnout." Now when I take a big step, I remember to honor myself by taking a bath, spending a weekend with my girlfriends, or knowing when to do nothing at all. It is this time off that recharges me and gets me ready for my next big step. For years, I have been going on runs down the road outside my house amidst rolling hills and vineyards. There is an uphill incline for the last stretch and still, every time, I am out of breath and unsure if I can make it. One day, I had a friend over and invited her to join me on my weekly run. On that final stretch, I felt my breath get heavier and I felt like I needed to stop. As I slowed down, my friend passed me to cross the finish. In that moment, everything inside me wanted to give up. I lost hope and lost my stamina. I started walking. Before she crossed the finish line, she stopped, turned around and started cheering for me. “Woohoo! You can do it!” she yelled. I looked up and smiled to see her cheering me on. Suddenly, I had the energy to keep going. She continued to clap and cheer me on as I crossed the finish line. With a little encouragement, I stopped thinking about my exhaustion, my aches, and my pain. My energy was completely restored. I realized it was so much easier to cross the finish line when there was a sister there cheering me on. When I actively brought more women into my life, and was willing to share my challenges and struggles, I found the support through other women kept me moving forward. It was in those vulnerable spaces with other women that I gained more strength and courage to step out as a leader. Have you been avoiding any of your innate feminine qualities? If so, I invite you to try listening to your intuition, being patient, resting into self-care, and joining with other women to see just what kind of magic will happen in your life. A couple weeks ago I was sitting on the beach in Costa Rica and everything on the outside was perfect: the sun was shining, the sky was blue, I was surrounded by palm trees and I knew I had worked hard to take myself on a vacation. Then out of no where I started feeling sad. I turned to my meditation practice, where I was able to watch my sensations and breath without judgement or need to change anything. I felt much better, afterwards but I could tell, something was still off. The next day I arrived at the yoga retreat I had traveled all the way to Costa Rica to attend. As soon as I arrived, my spirits began to lift as I met a beautiful new group of people. But that evening, I could feel a little bit of sadness still with me. I decided to let it be. Then a few days into the retreat I had this super magical moment. Our retreat leader, Sianna, invited me to play a song on the harmonium. I walked up to the front of the room and calmly accepted the invitation. I sang a chant I had been working on at home, and everyone sang with me. I walked back to my seat feeling a rush of joy and peace. I realized that even more than being surrounded by community, eating delicious food and taking care of my body, my soul was yearning to share my gifts. It was when I had an opportunity to give back, to do something I loved and also something that was a little scary, that everything changed. I spent the rest of the week on cloud nine because I had a moment where my soul had been seen. "Women have a soul need to express themselves." I've always found retreats to be a safe and healing space to practice being in my voice and sharing my gifts, and that's why I created opportunities just like this in the Rising Women Leaders Bali Retreat. I knew it was important to create a space for community and friendships to form, to have delicious food, and daily yoga, but I also wanted to create opportunities for women to inquire about and discover their innate gifts. The theme of the week in our Bali Retreat is self-expression: Expression through song, dance, writing, yoga and ritual. Workshops include: a cacao ceremony, how to reframe limiting beliefs, a new moon manifestation ritual, designing your dream life, opening the voice and self-expression through dance (to name a few!). Applications are only open for 5 more days...until this Friday, April 1st. If you've been considering joining us, I encourage you to take the leap and apply! Now if you've been feeling stuck or sad, I'm wondering how can YOU start sharing YOUR gifts? Maybe it's time to take out the art supplies, teach a class, read your writing out loud, or cook a meal for someone you love. Ask yourself: What do I love? How can I be seen? Where can I share and give more of myself? It may feel a little scary, unfamiliar or vulnerable, but know that I am right here cheering you on. I would love nothing more than for you to wake up everyday feeling empowered and alive knowing your soul is being seen and expressed. Have you ever dreamed of going to Bali? I have some exciting news for you today! Behind the scenes of my business I've been busy dreaming up 2016. It's been a patient process, requiring time to vision and reflect as well as gain clear focus and take consistent action. Now, those dreams are manifesting. I knew it was time create an in-person experience for women to come together in sisterhood, face their fears, tune into their intuition and manifest their wildest dreams for 2016. As the idea for a retreat took shape, it became clear the focus would be yoga, ritual and self-expression. It also became clear we would meet in one of the most beautiful places in the world: Bali. We will be exploring expression through yoga, writing, ritual, singing, speaking and dance as a way to step into courage, self-love and leadership. Do you want to be one of 13 women joining me in Bali? P.S. If you missed the free online class to Live Your Vision, you can now sign up for it and download my free guide on the Bali page! I’m approaching the two year mark of running my own business and have been reflecting back on how I’ve grown, what challenges I’ve overcome and how I’ve been able to transform through service and doing what I love. It all started a few years ago when I asked myself, “What does success look like to me?” For some it might mean reaching a certain number in their bank account, publishing a book, or receiving an award. For me, success is about the depth of the transformation I see in the women I serve, it’s about my ability to continue facing my fears even when I feel self-doubt or resistance, and to have a spaciousness in my schedule that allows me to truly take care of myself and follow my passions. We often want to see vulnerability in others but we are afraid to show it in ourselves. Being willing to be vulnerable is actually a courageous act, not a sign of weakness. Vulnerability creates greater connection and establishes a foundation of trust. People can relate to us when we share our whole selves. I remember when I first started blogging, it was the times I chose to share about my struggles and fears and how I overcame them when students would come up to me after my yoga classes to tell me how much my story helped them. The world is craving vulnerable leaders. Women want to relate to and understand the people they are going to follow. Where could you be more vulnerable and share more openly to create greater connection and trust in your life? Generosity didn’t always come naturally to me. I grew up with a mindset of scarcity shown to me so often. But, I saw being in a state of scarcity blocked my flow to receive. When I became generous, it came back to me in so many ways. Generosity also helped in my business. Even though I didn’t start with a lot of financial resources, I knew I could be generous with my time and my knowledge. When it came time to announce my first online program, people were ready and waiting to sign up. Where could you be more generous? Where may you be holding back your gifts, your time, knowledge or resources? It can be really easy to get caught up in achieving more, getting more and asking, “What’s in it for me?” But what really opens us to our own desired feelings and attracting more of what we want, is gratitude. When we tap into the feeling of gratitude, and really feel it in our body, we raise our vibration and send signals out to the universe that actually send us more experiences that will create what we feel. When you really feel it in your body and make a daily practice of it, just watch the magic that will happen in your life. When you tap into a vision that is larger than yourself, when you ask, “What kind of world do I want to live in? How can I help and give back to others?” Fear becomes so much less important. When you are so focused onyour goal, that vision, there is no more room for fear. We cultivate courage is when the desire of what we do want is stronger than the fear of what we don’t want. Courage isn’t about winning or battling over fear, it is becoming very focused in our vision and then going for it. When you ask, “How can I be of service?” You will be given everything you need to succeed. However, when the end goal is to make x amount of money, or get the new car, it’s going to be more of a struggle. When that vision has the potential to help so many more people, the universe is going to come in and give you support. What can you be in service to? What kind of world do you want to live in? What is even more important to you than your fears? When I feel afraid or unsure of what to do next, I go to my meditation practice. My practice is where I connect to my body’s wisdom, and I become a vessel for where spirit would have me go and what spirit would have me say. When we establish a constant connection with our body's wisdom we don't need to look outside of ourselves for guidance or affirmation. We can then connect to a deeper, innate love within. Then we can begin to know our purpose and service in this life and share our gifts generously. Then we can find the courage to face our fears in service to what’s larger than ourselves. I do my meditations in a series of 40 days. I get really clear on the vision I want to create in my life and in the world and I allow my meditation to be in devotion to that vision. My greatest vision now is to see women all over the world finding this kind of connection and love within. That is where we find the courage to love and take care of ourselves, the courage to live our passions, and express ourselves in service to what we love. That is when we naturally inspire those around us and create beautiful change in the world. I’ve been creating this Vision by sharing my 40 day practice with others and creating a community of women around the world cultivating the courage to be fully devoted to themselves, to spirit and to sharing their light. As we talked, more people came into the room and laid out their mats, I asked her, “Do you have any wisdom to share with us?" Because isn't that we are alive for anyway? To be happy? To do what we love? I thought of my own life, and all the little things I had been stressing about all week. Yes,I had chosen a career that was my passion, but was I really doing what I loved every singleday? I made a vow right then, to let go of all the little worries and fears and re-commit to my joy, my happiness and taking the time every day to do something I loved. We all have one precious life. How are you going to live it? Now, we all have different versions of success, so wherever you are in your business (or your life) I invite you to ask: What does success look like to me? What does it feel like? What is my wildest dream? I believe everything you want and desire for your life can be yours. All you have to do is listen to your intuition and be willing to face your fears, again and again. Often the thing we want most in our lives also takes us face to face with what we are most afraid of. 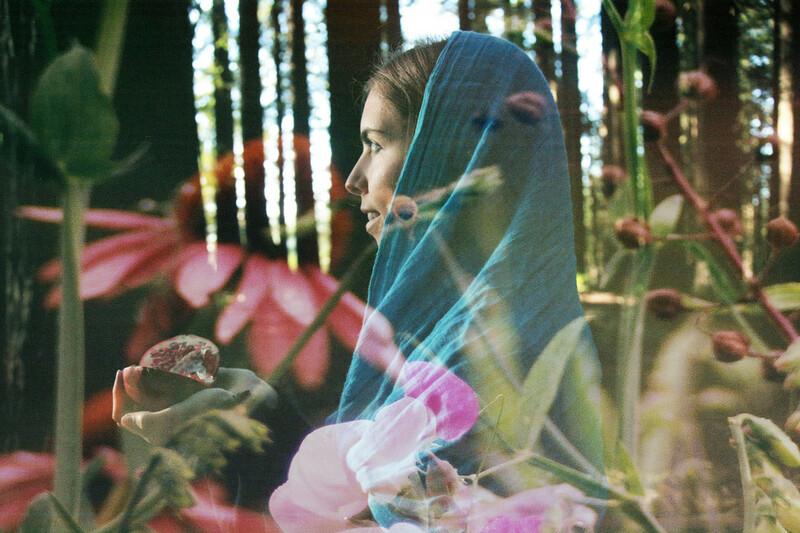 When I was growing up and heard the word "priestess," I thought of boring sermons at church, wearing clothes I didn't feel comfortable in and being forced to sit quietly when I wanted to play outside. I didn't know much about what it meant to be a priestess other than it was probably the female version of a "priest." As a playful young girl, the thought of becoming a female priest sounded pretty mundane. Read the full post on Over the Moon Mag. 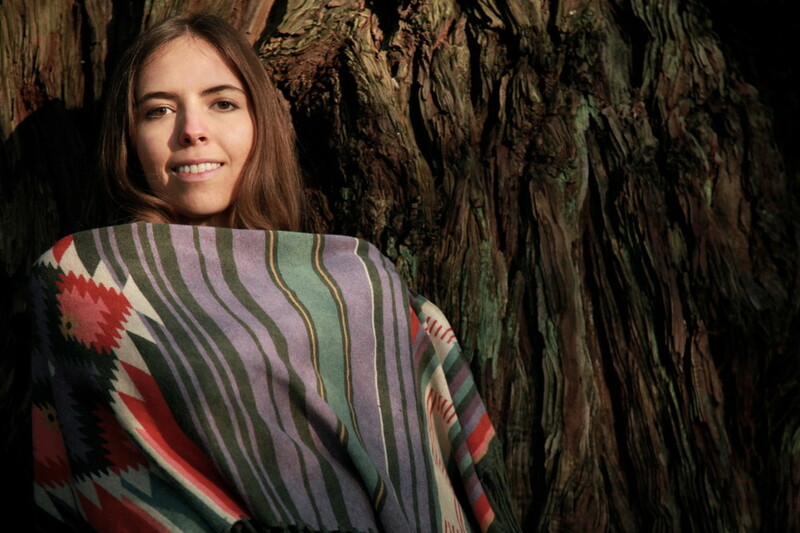 A few days after the New Year, I got together with mystical artist and photographer Jasmine Amara in the redwoods of Occidental for a portrait session. I first met Jasmine before she joined my group coaching program, "Let go, Vision Transform." Jasmine knew she was passionate about dreams, water, and photography, but didn't fully believe she could support herself through those passions. Over the course of the six-month program, she came up with an exciting idea for a photography exhibit. 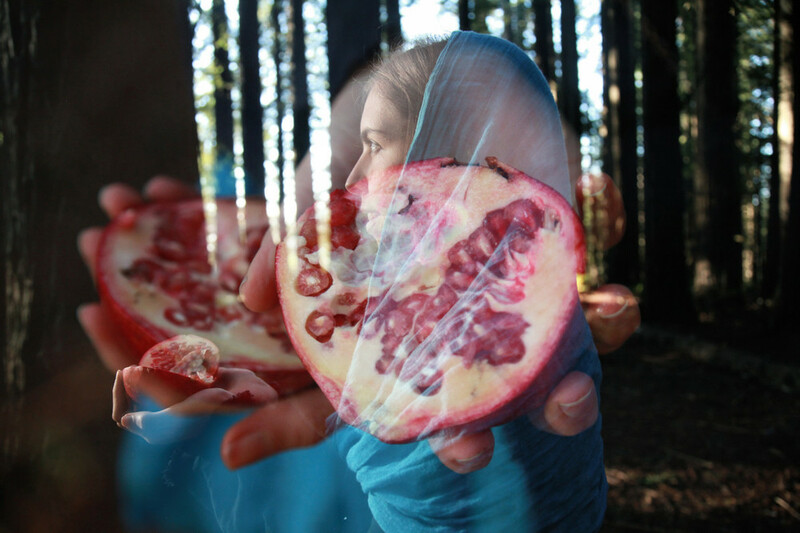 With some encouragement from me and the women in the group, she began taking photos for her series "Dreaming Awake" creating lucid imagery through double exposures. When I first saw the images I acknowledged her for how unique and powerful they were. Over the months that followed, Jasmine began to create a business for herself doing what she loved. When she announced her offering of Visionary Portraits, I was inspired to participate. Leading up to my portrait session, she asked me a series of questions.. One of those questions was, "What is your deepest desire?" I sat with that question for a few days, and eventually wrote this piece, (Which I sent to you a few weeks ago.) It was about the feminine rising, women stepping up to take supreme care of themselves, to face their fears, and develop the courage to take care of the world. Before our session, she asked me to read my deepest desire. She created a sacred space with flowers, dreamcatchers, and sipping chocolate (ceremonial cacao from her travels in Guatemala). Being witnessed in sharing my deepest desires in such a sacred and intimate space was a powerful experience. Then, she took these photos. To have this moment captured through photography was invaluable. When I saw the beauty and magic we created in the photographs, I was in awe. After seeing the images I thought, "If Jasmine had never taken the steps to believe in her art, these images wouldn't even exist!" So today, I invite you to look through the images, and to ask yourself, "What gifts am I hiding from the world? How could I be of higher service to others through my gifts and talents?" It's time to honor whatever hidden creative potential lies inside of you, ready to rise to the surface. Do you know what it is? I'd love to hear in the comments. P.S. My next free teleclass series is filling up. I'd love to share my latest insights with you, over the phone, or through the recordings. Find Your Glow As a Feminine Leader:Just sign up here. I was recently thinking back to when I first started teaching yoga. I went a whole year after my training before I started teaching. I used the excuse, "I don't know enough yet" and I went to find more trainings. But really, I was afraid of being seen as a teacher or a leader. I felt insecure, my skin was breaking out and I wasn't eating well. However, I didn't know any better. I was eating lots of sugar, dairy and flour while I travelled India going to meditation retreats and trainings. When I returned home, the thought of being in front of my friends, let alone a group of students at the front of the room teaching, felt terrifying. Because I didn't feel good in my body, I didn't have the confidence to stand in front of the room as a teacher. I didn't have the courage to lead. Luckily around that time, I started learning about nutrition, and how what I was eating was affecting my body. I read the book, 12 Steps to Raw Foods, by Victoria Boutenko and decided to try eating raw foods for a few weeks to cleanse my body of all the toxins I had accumulated from a poor diet. The better I felt in my body, the more courage I had to take risks and lead from my heart. The last few years I immersed myself into books, programs and school to learn more about nutrition, how to clear my skin, and develop more confidence from the inside out. Many of my clients have had similar challenges when it comes to sugar cravings, imbalanced hormones, mood swings and cystic acne. I see many women trying to reconnect to the rhythms of their body, but not sure where to start. I decided it was time for me to share this knowledge. I created a teleclass series, Find Your Glow As A Feminine Leader. to share the steps I used to clear my skin, nutrition tips to balance hormones naturally, sync with your cycle and tap into feminine energy to develop a fearless inner confidence to become a leader and a teacher. I am overflowing with information on this topic, way more than I could share in a blog post or email, so I created the teleclass series for those of you ready to go deeper and learn more. If you feel called, sign up here! Meredith Rom empowers women to access self-love and divine feminine wisdom through yoga, coaching, and writing.